When describing the genesis of the 1971 animated film The Point, Harry Nilsson said the idea came to him when he was “on acid and I looked at the trees and I realized that they all came to points, and the little branches came to points, and the houses came to points. I thought, ‘Oh! Everything has a point, and if it doesn’t, then there’s a point to it’” (Jacobson, 2004). While Nilsson may not have actually inspired anything about Manuel DeLanda’s Assemblage Theory–a refinement and expansion of ideas from Gilles Deleuze and Félix Guattari–this quote could serve as a tongue-in-cheek thesis statement for the work. Manuel DeLanda is a philosopher and filmmaker who lives in the U.S. and, in recent decades, has cultivated an interest and expertise in the philosophical works of both Deleuze and Jean Baudrillard (Cvjeticanin, n.d.). The idea of assemblages explored here originates from Deleuze & Guattari’s book, A Thousand Plateaus, where assemblage is defined as “a multiplicity which is made up of many heterogeneous terms and which establishes liaisons, relations between them, across ages, sexes and reigns – different natures” (DeLanda, 2016, p. 1). For the most part, DeLanda hews fairly closely to the theory of assemblages presented therein, framing this work as an “attempt to bring these different definitions together, introducing and illustrating the terms required to make sense in them” (p. 1). In the endeavor to define and explore assemblages across a variety of disciplines he mostly succeeds, with the exception of a discussion of topics related to the virtual that obfuscates and nearly sinks the whole construction that is presented. After introducing important structural and definitional concepts, DeLanda uses the first few chapters of the book to refine these ideas and uses them to contextualize different historical assemblages. Concepts important to defining the construction of assemblages–exteriority vs. interiority, coding, emergence, singularities, historical entities, and territorialization–are all defined and set in several historical contexts including Human History (Ch. 1), the Evolution of Languages (Ch. 2), the Weapons of War (Ch. 3), and Scientific Practice (Ch. 4). Myriad examples in these chapters help show how assemblages form from heterogeneous components which ebb and flow as they are encoded / decoded and territorialized / deterritorialized. Assemblages themselves form larger assemblages, painting a complex systems theory that DeLanda uses to great effect with the assistance of these examples. In later chapters, the topic turns to the virtual and to a concept that DeLanda calls the “diagram” of an assemblage, a sort of “potential space” describing possible attributes of an assemblage that aren’t currently displayed. In these latter chapters, the coherent tapestry of assemblage theory begins slowly to unravel. Discussion of assemblages and components thereof is tacitly abandoned for an exploration of their virtual counterparts, or diagrams. A description of something akin to a potential space, or representation, is described and explored, only to be seemingly tossed aside as a step towards “reified generality” (p. 138). Another section leads to conceptions of topological time and counter-actualization, concepts that DeLanda concedes are so abstract that special tools are needed: “Tools to manipulate these intensities… in the form of a growing variety of psychoactive chemicals that can be deployed to go beyond the actual world, and produce at least a descriptive phenomenology of the virtual” (ibid., p. 133). Until some rogue libertarians rescue the world from the tyranny of psychoactive sobriety, though, I fear these concepts shall remain shrouded in an impenetrable haze of conjecture. Fortunately, the rest of the book is more accessible and, as an attempt to define and explain a theory of assemblages, this work is largely successful. 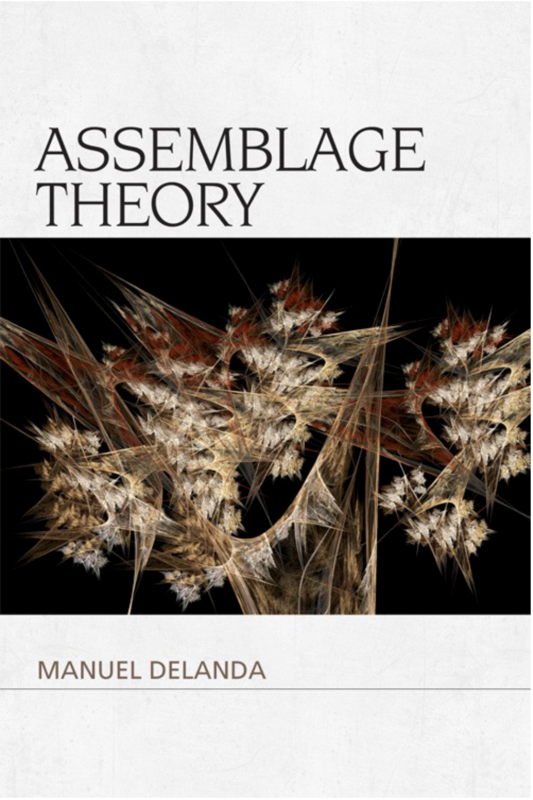 DeLanda’s description of the components of assemblages and the ways in which they emerge based upon the coding and territorialization of their components is lucid and the historical examples help define a clear image of the concepts. As a materialist philosophy, the idea of assemblages is an attractive way to construct the dynamic interrelationships between history, components, and the whole that emerges from them. Several fascinating ideas are presented in an effective manner, including that the properties of an assemblage (or system) are emergent and not simply the summation of the properties of components, and that the history and ‘individuality’ of the assemblage is key to its properties, something DeLanda calls the “processes of individuation” (p. 140). These ideas are important to the theory and provide useful and welcome scaffolding for other conclusions. Assemblage Theory works to refine and clarify some of Deleuze and Guattari’s ideas. There are interesting views worth considering for sociologists and those who wish to explore ideas of complex systems and their components. If, perhaps, someday another author attempts to summarize and expand upon a vision of assemblage theory, this edition will undoubtedly prove an invaluable reference. Unfortunately, an opaque treatment of the virtual and the complete lack of a unifying conclusion–or concluding statement of any kind–prevent this work from effectively making its Point. DeLanda, M. (2016). Assemblage Theory (First). Edinburgh: Edinburgh University Press.